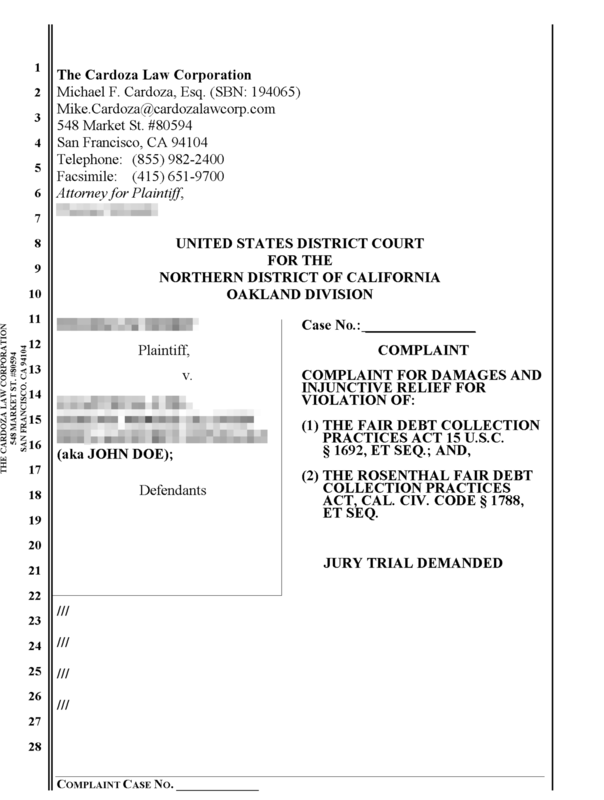 Use California Consumer Protection Laws to Sue Your Debt Collectors & Make Them Pay for Harassment! You understand why your credit card company is coming after you. You may have been responsible for the charges, you fell behind in the payments—and now you’re the one who believes that they have to deal with the consequences. But the way they are pursuing you is getting out of hand: calls every day, letters to your family members, and even emails that are threatening to ruin your credit score. Are companies really allowed to do whatever they want in California? The Answer is “NO!” when you use The Cardoza Law Group to Sue Your Debt Collectors for Harassment! Credit card companies and other lenders want consumers to believe that they are powerless once they have signed on the dotted line. However, this is far from true. Consumer protection laws were created to change the natural balance of power between creditor and customer. These laws protect consumers from fraud and scams, but also from harassment by bill collectors, utility shut-offs, and loan collection practices that can lead to anxiety, distress, lost wages, and bankruptcy. Yes, You Can Sue Your Debt Collectors! At The Cardoza Law Corporation, we have seen firsthand the weaknesses in the debt collection industry. We use the written and verbal communications between you and your collectors to prove that your credit companies have violated the law—and we hold them accountable for their errors with fees and penalties. These penalties may be large enough to not only clear your debt (if it even existed in the first place), but even have enough left over for a cash reward that goes straight into your pocket. I am uniquely qualified to represent clients who are suffering from consumer debt collection. As a former debt collections executive, I know that collection agencies have a tough time proving that you owe a debt and that they accidentally and intentionally violate consumer protection laws with great regularity. When debt collectors violate these laws, they give consumers the right to take legal action against them, opening themselves up to thousands of dollars in potential liability for compensation to the consumer. It is possible to actually sue your debt collectors. If the debt collection agency contacting you is violating these laws, you may be able to file a lawsuit to protect your rights as a California consumer. If this sounds familiar, click here to request a free case evaluation. Consumers will often have more than one creditor calling to collect, turning a rough financial situation into a deep well of debt that feels impossible to escape. It is not. I can help you deal with all of your creditors and collectors, getting you the leverage you need to get back on the Path to Prosperity. Posted on 11/08/2018 You Can Stop Debt Collectors From Contacting You, But You May Not Want to! ?Will having a debt collector after me lower my credit score? ?Can a debt collection agency garnish my wages? ?When and where can a debt collector call me? ?What can I do if a debt collector is harassing me? ?What details does a debt collector have to provide about my debt?